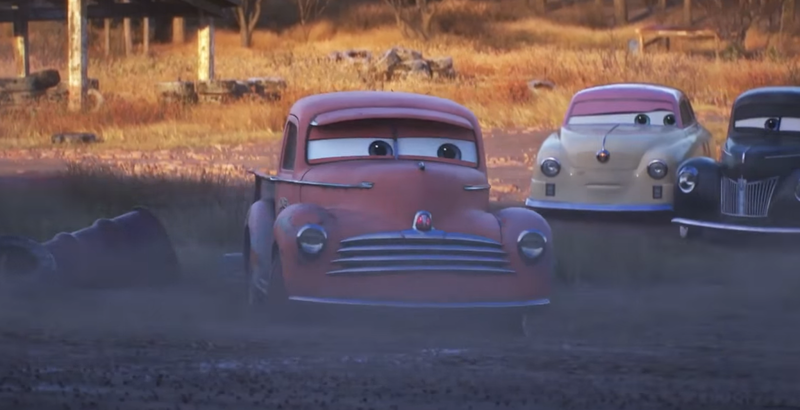 Here we have one of my favorite characters from Cars 3...Smokey, Doc Hudson's former crew chief and owner of the "Best Dang Garage in Town"! This is the same Mattel 1:55 scale diecast that was released back on May 1st, but he now comes with a poster/checklist (which I'll show you down below). 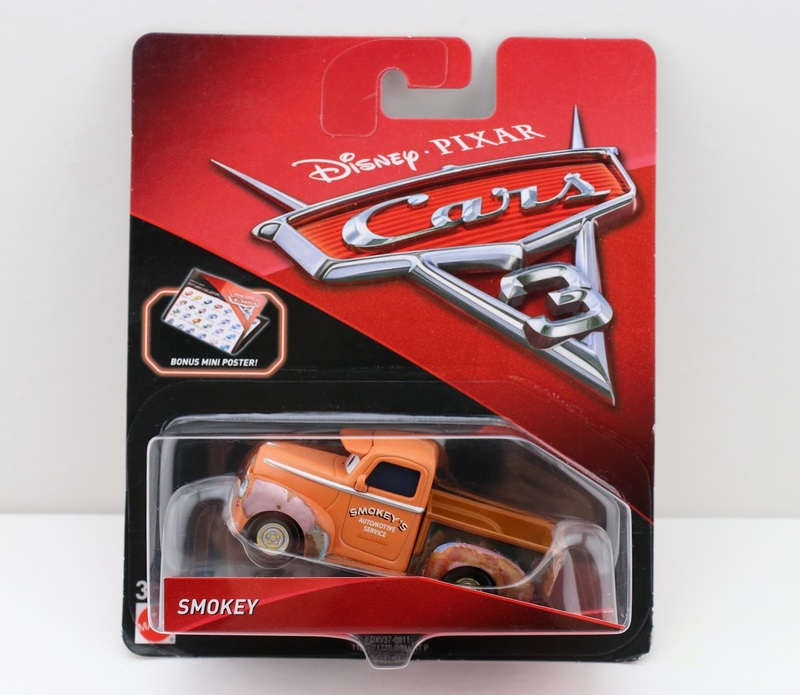 Full disclosure: I have the day one release of Smokey as well and I only picked up this re-release of him recently because I thought he was the new updated variation. My goofy mistake...I saw the "bonus mini poster" and jumped the gun, assuming it was the new one. "An updated version of Smokey? ", you might ask. 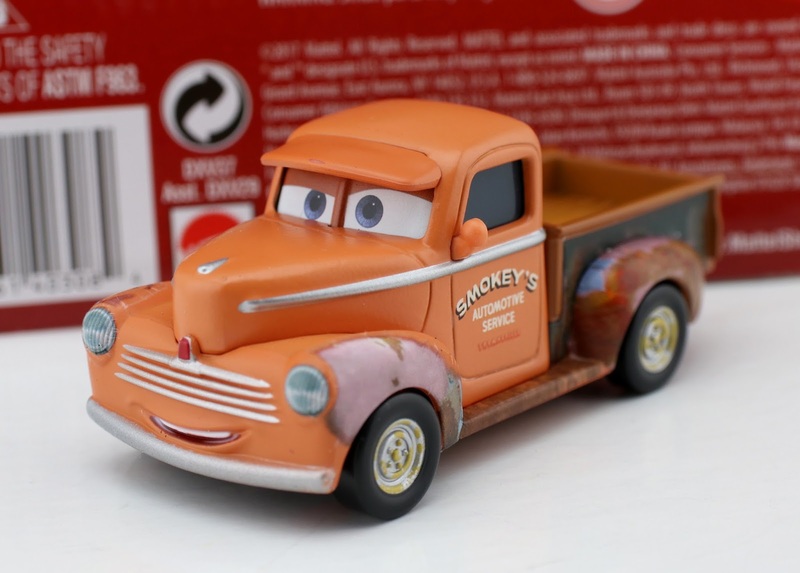 Yes, there is a new, more movie accurate diecast of Smokey in stores now without any side mirrors (he actually doesn't have them in the film, Mattel got that wrong here). The new variation also has a slightly different color paint job, a longer bed and some more subtle added details. If I'm able to ever find that one, I'll update this post with photos. 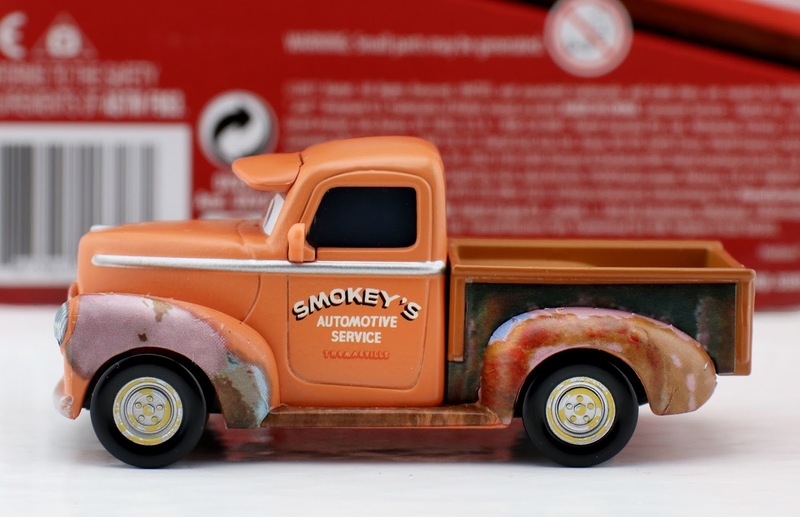 In the mean time, check out the standard version of Smokey below—still a good diecast overall! 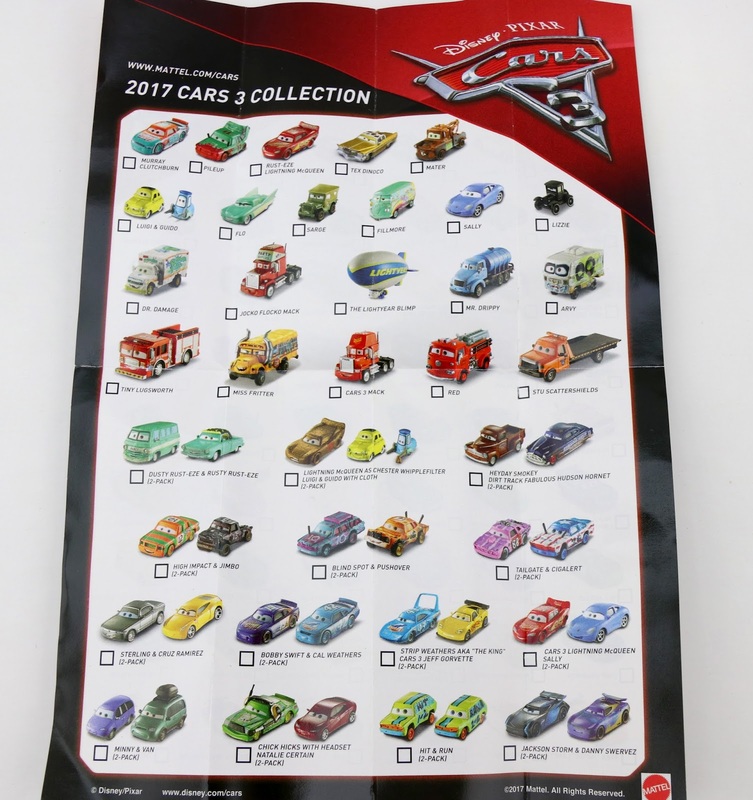 Here's the Cars 3 mini poster/checklist that comes with this latest case of diecasts now hitting Target. 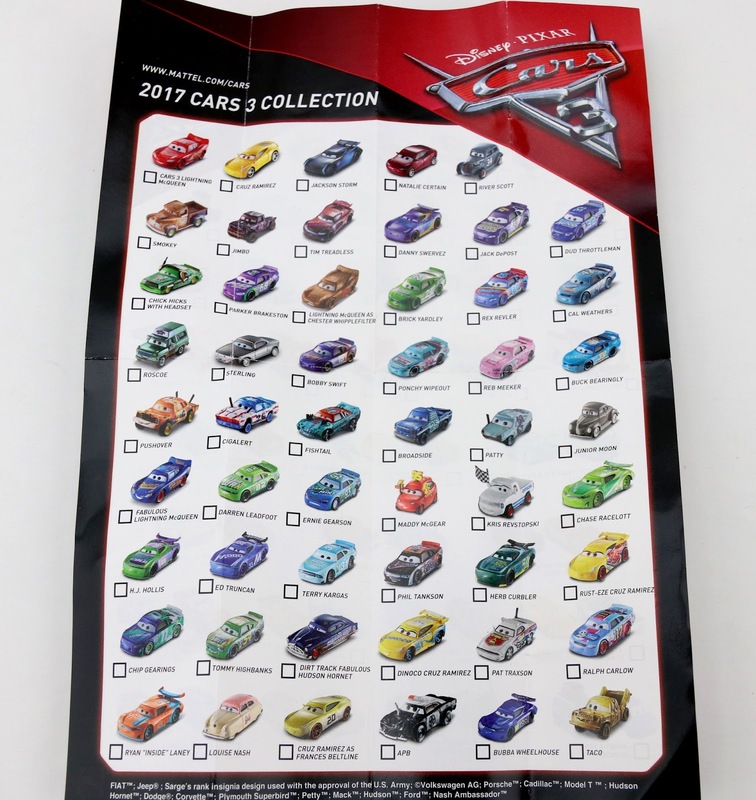 I like how it adds Fabulous Lightning McQueen and Rust-Eze (95) Cruz Ramirez, since they weren't included on Mattel's original poster release due to spoilers. This poster, however, does not feature any of the "Super Chase" characters. 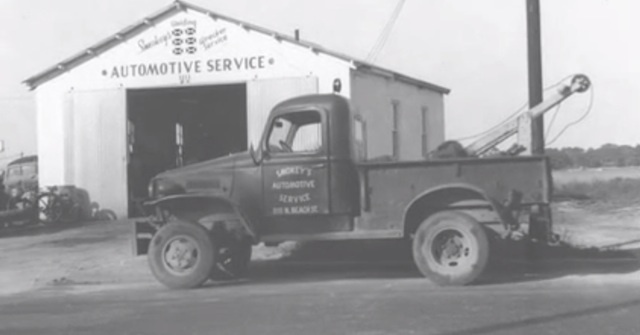 FUN FACTS: The character of Smokey in Cars 3 is inspired by real life mechanic Henry "Smokey" Yunick, who was also a car designer, stock car owner, racer, crew chief and overall NASCAR automotive pioneer back in the 50's/60's! 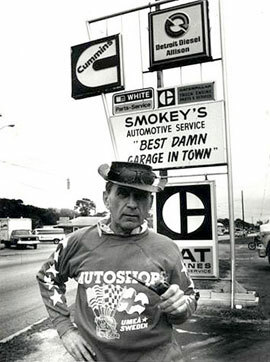 Additionally, the name of Smokey's garage in the film— "Smokey's Automotive Services: Best Dang Garage in Town"— stems from Yunick's famous real life garage (which was located in Daytona Beach, Florida) of (almost ;) the same name. Learn more on the official Smokey Yunick website HERE (who seem very proud that he's represented in Cars 3). If you haven't yet, be sure to pick up this Smokey diecast for your collection at Walmart, Toys R Us, Target or Amazon using the direct link below. He's very easy to find as a single and is even available in a Toys R Us exclusive 5-pack called "Training with Smokey." Let me know your thoughts in the comments below! Have you found the updated variation?